Timeline of events in Heckman v. Suntrust et al. The timeline below is based on court documents, interviews and allegations in a March lawsuit by Elliston residents Trinity and Jessica Heckman against Suntrust Mortgage, Fannie Mae, Nationstar Mortgage and Professional Foreclosure Corp. of Virginia. June 2006 — Trinity and Jessica Heckman purchase their home in Elliston for $134,000. They get a mortgage with Flick Mortgage Partners and the payment is about $1,100 per month. The loan is later taken over by Suntrust Mortgage. November 2006 — The Heckmans allow Suntrust to begin automatically withdrawing $550 mortgage payments from an account at BB&T every two weeks. February 2007 — A Suntrust rep phones the Heckmans and warns them they’re behind on their mortgage. Jessica tells him about the automatic withdrawal agreement. He says he’ll check into that, and calls back a week later, apologizing for the inconvenience. November 2007 — Suntrust sends the Heckmans a letter indicating the Heckmans are in default. Jessica checks her bank statements again and realizes Suntrust has been automatically withdrawing the payments from her account, but that in September it had redeposited more than $6,000 to it. She offers them that money but Suntrust wants $12,000 to get current. November 2007 — The Heckmans apply for a mortgage modification through Suntrust and agree to raise their monthly payments to $1,400 while that application is being processed. Suntrust says this will forestall the foreclosure. December 2007 — In The Roanoke Times legal ads on Dec. 20 and Dec. 27, the Heckmans’ home is advertised for a foreclosure auction scheduled for Jan. 4, 2008. Jessica calls Suntrust and they tell her not to worry; they’ve canceled the sale. Jan. 4, 2008 — At Suntrust’s direction, Professional Foreclosure Corp. of Virginia auctions the Heckmans’ home, on Jan. 4, 2008. FannieMae pays $117,500 for it. The Heckmans are unaware of the sale. Jan. 22, 2008 — Professional Foreclosure files a deed in Montgomery County Circuit Court naming the owner of the home as Fannie Mae. February 2008 — Jessica Heckman finds an eviction notice on her door that gives the couple two weeks to get out. She calls Suntrust and they tell her it’s a mistake and not to worry. May 2008 — The Heckmans’ mortgage modification is approved, and the modification is recorded in Montgomery County Circuit Court in October 2008. The Heckmans’ payment climbs to $1,444 per month. December 2010 — Suntrust transfers the mortgaging servicing to Nationstar Mortgage of Texas. The Heckmans continue the $1,444 payments. August 2012 — Nationstar sends the Heckmans a $1,000 check. It tells the Heckmans that was for escrow overpayments, and later the company cuts their monthly payment to $1,333. March 2013 — Nationstar has a title search done on the Heckmans’ home. The title search reveals the house was sold at foreclosure in 2008 and that Fannie Mae is now the deed holder. Nationstar does not inform the Heckmans. March 2014 — The Heckmans apply to Nationstar for a refinance to lower their mortgage interest rate and their monthly payment. Nationstar denies it because the Heckmans lack flood insurance. They discover that’s because Nationstar had stopped paying the flood insurance premiums in 2012; and that’s the reason Nationstar sent them a $1,000 check and then reduced their monthly payment. November 2014 — Nationstar raises the Heckmans’ monthly payment to $1,855 to account for a new flood insurance policy. The Heckmans consult a lawyer, and in looking into that, he discovers their house had been sold at a foreclosure auction in 2008. He advises them to cease all payments. January-February 2015 — Nationstar declares the Heckmans are in default on the mortgage. March 2015 — Attorney Jonathan Rogers files a lawsuit alleging fraud and breach of contract against Suntrust, Nationstar, Professional Foreclosure Corp. of Virginia and seeking the return of the house from Fannie Mae. SunTrust Mortgage gets busted by sitting judge over an elaborate Adulterated Email Scheme and #SunTrust later commits Fraud on the Court while attempting to cover up the scheme. Do you or someone you know have a Mortgage with #SuntrustMortgage ? Does Suntrust Mortgage owe you money they perhaps unlawfully collected while lacking authority? SunTrust Mortgage agrees to a Federal Consent Order stemming from serious banking violations, in part agreeing to adhere to all state and federal laws. Yet, SunTrust appears to breach its Consent Order resulting in North Carolina being forced to revoke Suntrust Mortgage authority to transact business. Thus raising the question, did SunTrust unlawfully originate, service and foreclose on loans while being out of compliance? 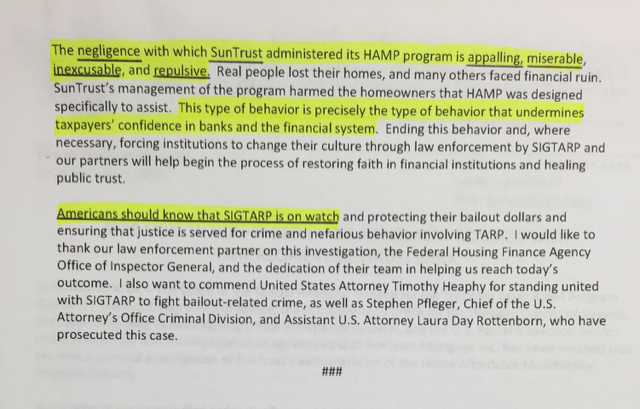 How will SunTrust mitigate such to borrowers given its compliance failure?